Elder Lee M. Harris and his wife, Valerie, will attend the fifth annual tribute to the late legendary singer, Sam Cooke, in Memphis, Tenn., the first weekend in April. Harris has been asked to speak at the event as a representative for Consciousness Magazine, a Chicago publication. "The family of the legendary singer sends their appreciation for the kind hospitality shown to their relative Erik Greene back in early February when he visited Southern Pines," says Harris. A trip will be taken to Clarksdale, Miss., the birthplace of Sam Cooke, where the city of Clarksdale will honor the singer's name as a permanent yearly holiday. They will be having lunch at actor Morgan Freeman's Restaurant, Ground Zero. The trip will also include a visit to the legendary Stax Records Museum in Memphis. 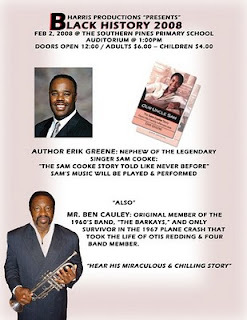 The Harris’s will be in company of Ben Cauley, the ex-Bar-Kays member who also visited Southern Pines, the Sam Cooke family, including Erik Greene, and the Rev. Al Green.